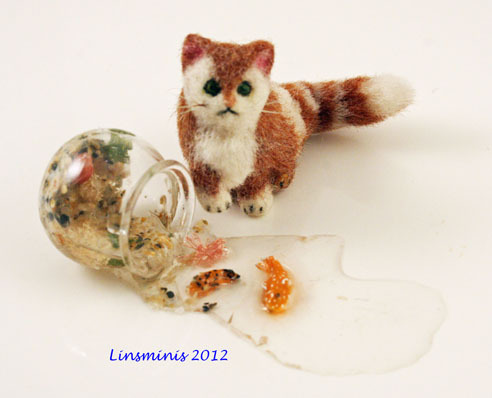 linsminiartform: A New Year & A New Direction! A New Year & A New Direction! Does anyone else feel like me...that they just don't know where the time goes (a great Dylan/Judy Collins song!)? I can't believe that the last time I actually had the time to blog was over a month ago, not that I really have time right now either, with a houseful of family (11 of us, I think! ), a joint cooking in the oven & the veggies to get preparing, while the men are in the local rugby club discussing the important things in life that will no doubt get sillier & sillier as the pints are consumed! A girl needs a little bit of peace & quiet though & before I start the marathon of feeding them all, here I am with my laptop, some nuts & a LARGE gin & tonic, making a very quick blog post...if nothing else, just to let you know that I am still alive & kicking......just! I have had absolutely NO time to get my clays out to make food as the making of the real thing is almost all consuming with so many hungry people in the house BUT since my visit to the desert in March I've had a couple of schleich kitties sitting on my workbench waiting to get a nice wooly coat. They started life as conjoined twins, but after a few operations with my scalpel to separate them & a little bit of clay to give them new tails & the odd new paw, they were ready to "get dressed"! Scraps has been a little naughty & raided the wool basket, getting himself wrapped up in wool in the process! While Tiger has been even naughtier & has pulled over the goldfish bowl when no-one was looking but is sitting next to it trying to pretend that the overturned bowl, with fish flapping in the water has absolutely nothing to do with him at all! 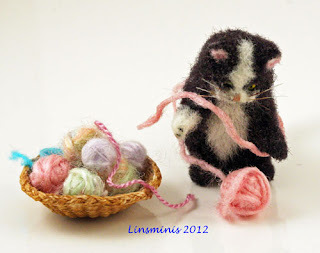 I can see that there will be more little animals getting new coats in 2013!